Being a mother and a professional actor can become quite a handful at times. But certified Family Medicine physician, Rachael Ross likes juggling between both of them. She works in the Emmy nominated show, The Doctors, and also took care of her child back home. How is she able to do all that? Well, we shall find out in the section below. Not many people are able to cope-up with their growing professional life and busy personal life. Many of you already know how it feels to take care of a toddler and that too when you also have some work of your own. But television star and sexologist, Rachael doesn't have any issue moving back on forth between her professional and personal life and she is doing a pretty good job at that. Also, see; Actress Camryn Manheim is a Mother of one Child; Find out the identity of the child's father? The reason behind her motivation maybe her acceptance of life and her duties towards the family and work. Many of us are yet to accept the responsibilities whereas Rachael is miles ahead of us. The TV actress became a mother for the first time after the birth of an adorable daughter named Rebekkah Story Ross. She named her daughter after her late sister who died tragically some time back. Upon the birth of her daughter, she shared a cute Instagram post showing her tiny little feet. She went through the natural process while giving birth to her daughter. Her daughter weighed eight pounds and 21 inches in length. Now about her father, Rachael is yet to make any remarks about who is the proud father and husband. Back in 2016, she did say something about watching the movie, Vaxxed, along with her better half. As far as we know, he is a doctor as well. Ross is not ready to reveal the identity of her husband to the public just yet. As well all know the actress is pretty much silent about her relationship and not much is known about it. The actress never stated anything regarding any previous boyfriend. Now if she is currently married to her husband then we're sure this is the first marriage for her. Apart from that, she was never married to anyone before. Well, we do hope she discloses the identity of her boyfriend pretty soon. Born in 1975, in Indiana. She is the daughter of David Ross and Ruthie. She is one of three children of her parents. Her sister and brother both are doctors. She lost her sister due to sickle cell anemia in 2011. 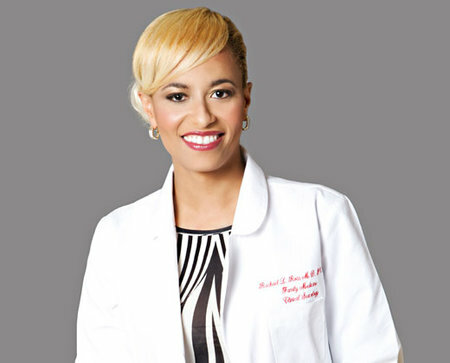 She is famous for hosting the Emmy-Nominated show called, The Doctors.